I'm gonna try to keep this thread simple and easy with straightforward info and actual screengrabs of each program. 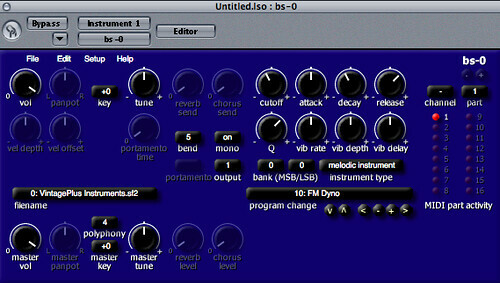 bs-0 is available for Steinberg VST 2.4, and Apple Audio Units plug-in formats. "You can play all SoundFont 2 files for Creative Sound Blaster series, and DLS (Downloadable Sounds) files on your host application. bs-0 supports Mac OS X and Windows ." 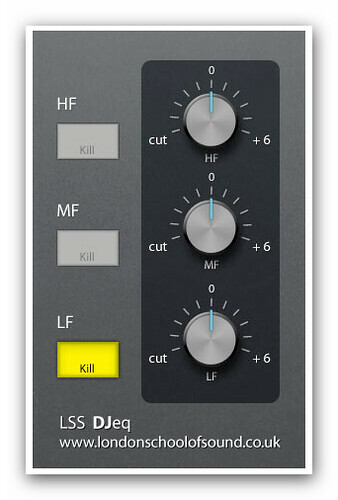 "
Features : "STSideComp from STSoft is a FREE fully parameterized compressor with a sidechain input stereo channel. It is designed as a VST effect for MacOSX and is specially created for Ableton Live. "You can use the plugin especially in modern music styles like House or Techno in order to gain the typical ducking effect, best known from French House." 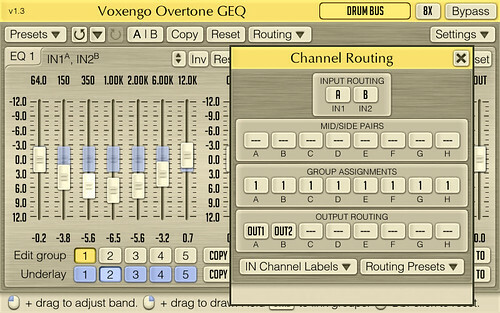 "
Feautres : "Voxengo updates the FREE Overtone GEQ to version 1.3. This is a great 7-band harmonic equalizer with multi-channel support. * Equalizer curve scaling function. * Equalizer curve inversion function. "Overtone GEQ was designed to allow audio engineers to apply quick EQ shape adjustments together with adding a bit of harmonic richness to the audio material (mainly mixes and sub-mixes due to a comparably high processing load this EQ puts on a CPU)." 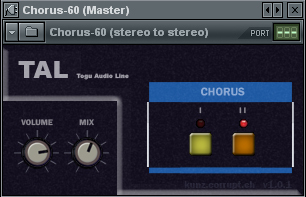 "
Features : " The free chorus plugin Chorus-60 from Togu Audio Line has been updated to version 1.3.0. * Presets are compatible with older versions. "This is a standalone version of the chorus implemented in U-NO-60." "
Features : " The LSS DJeq from London School of Sound is an equalizer plugin for Mac and Pc, designed specifically to emulate the controls found on DJ mixers. It features three rotary controls for Low, Mid and High frequencies and dedicated Kill switches. The interface is optimized for live performance, with large buttons and knobs easy to read and grab even with a laptop track-pad. The EQ range has been specifically designed to allow for traditional DJ use, with a range that goes from complete cut to + 6dB. 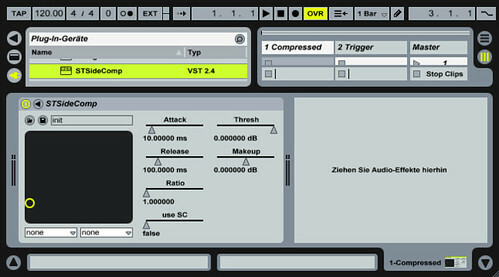 While the plugin might work in other VST-compatible hosts, the LSS DJeq is the result of user feedback from the Ableton Live courses at the London School of Sound, and as such it was meant only as a plugin for Ableton Live. no attenuation or boost when the EQ knob is centered, a fine control when boosting and a quick response when cutting. Requires Pluggo's runtime library (FREE) 3.6.1 or higher. 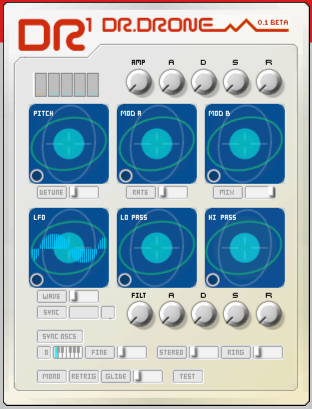 "LSS DJeq - the missing VST plugin in Ableton Live. Completely FREE to use and re-distribute"
Features : "Martin Wheeler presents DR1 Dr.Drone, A new VST Synth with a huge electro sound. Inspired by vintage analog hardware such as Moog, Octave and Polivoks. There is a FREE demo version available. A fully registred version cost only £10, so this is a really interesting piece of software! " "The legendary silver box which is hallmark in electronic music has been recreated in AudioRealism Bass Line."" Features : ""Oligarc is a collection of four world class virtual analog FX, tied together by a modulation nerve center that converts the input audio into control signals that can be routed to most of the effect knobs. Oligarc can be an LFO-driven filter, an envelope-controlled phaser, a gate-triggered saturation effect, or anything else you can think up, including mad combinations of linked modulation of multiple effects at once." 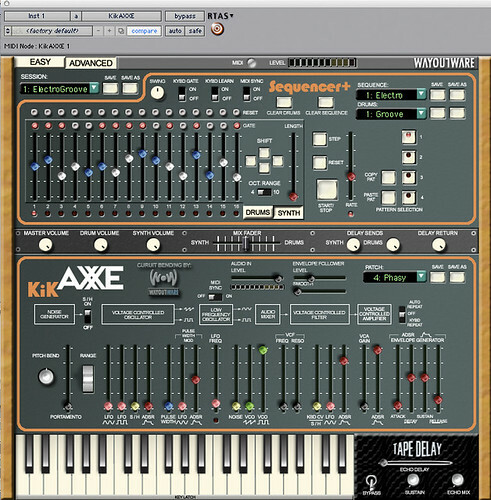 Features : " M-Audio / Way Out Ware updates the virtual synthesizer KikAXXE to version 1.0.4. Changes: KikAXXE for Mac OS X has been updated to address an issue that caused it to fail on startup for some users. The update also includes support for MIDI out of the step sequencer in the VST and RTAS versions. This Vintage Analog Synth has features like authentic emulation of the 70's ARP Axxe, 16-step, analog-style sequencer, classic drum machine sound and tape-based delay emulation. " # The "Dry mix" parameter implemented. # Output routing arrangement changed - it is now possible to route the same internal channel to several outputs. # "Loud noise" issue happening in Reaper fixed. # A possible cause of a rare occasional crash resolved. # Cubase/Nuendo freeze after their track level meter dragging fixed. # Parameter automation freezing in Logic/Mac OS X fixed. # "Mouse wheel sensitivity" global setting renamed to "mouse wheel precision". 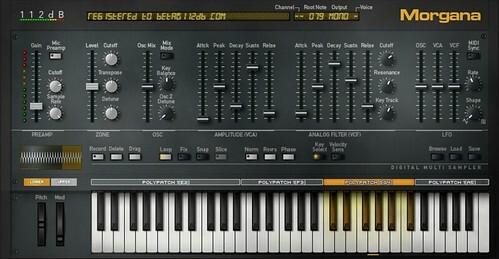 "VariSaturator features two saturation modules which are applied in sequence, in two-band mode each. The valve saturation module applies asymmetric valve processing that closely resembles sound of valve amplifier cascade, and being a digital emulation, it applies its best sonic features without side artifacts like noise, strong phase shift and high frequency roll-off." VST and Audio Units versions for Mac OS X 10.,4 (Tiger) and 10.5 (Leopard). Mouse scroll wheel support for sample editor (both up/down for zoom and left/right for shift). LCD value display stays for a few seconds after adjusting control. Sample editor redraws much faster for big—more than a few MB—files. Switching modules could under some circumstances corrupt zone settings. "Morgana is an authentic representation of a vintage digital sampler, designed to be musical rather than accurate while simultaneously free from the clumsy interface or sub-megabyte RAM limitations plagued by old hardware." "
# Fixed a problem switching from TDM to RTAS. # Fixed window scrolling error. "For music mixing, sound design, remix and more, SoundToys is the industry standard in professional audio effects plug-ins. With professional sound quality, design, and innovation that comes from a tradition of building great effects, SoundToys brings the sound of studio effects hardware to the world of desktop audio production." Features : Expert Sleepers releases Augustus Loop version 1.7.0 beta 1. Features a new GUI, The filter has been fixed and a 'Tape Stop' button has been added. "Augustus Loop is an emulation of a tape-based delay effect, with some extra features to facilitate its use as a looping device." 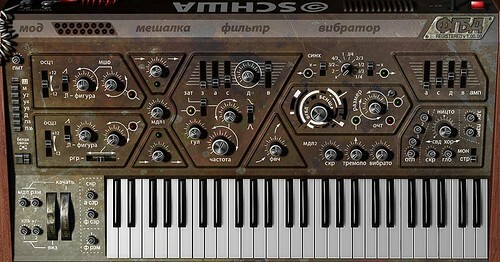 Features : Stillwell Audio (Schwa) has univeils Olga - a virtual analog synthesizer designed to be distinctive. "Imagine a handmade experiment from an unlikely place, a synthesizer so full of life and character that it earns the right to be called a musical instrument. Olga encourages risk, experimentation, and exploration, and rewards you with unexpected and exciting sounds, vibrant and human. This is the dusty gem you could spend your life searching for." Features : Puremagnetik unveils TeeBee - a TB-303 Micropak collection for Live, Kontakt & Logic. Using advanced mapping techniques and extensive multi-sampling, TeeBee is a flawlessly cloned TB-303 for the modern DAW. 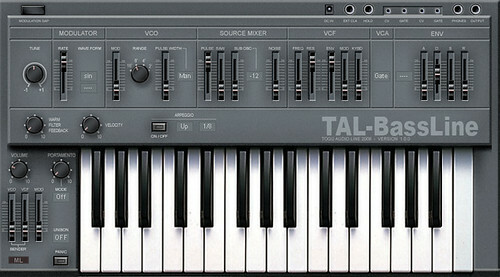 "The TB-303 is THE sound of acid and techno house music! 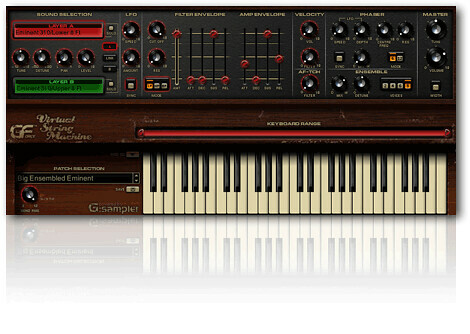 It's a monophonic analog bass synthesizer married to a pattern-based step sequencer released in 1982. It features a single analog oscillator with two waveforms (saw or square) and has a simple but excellent VCF filter with resonance, cut-off, and envelope controls. There are also knobs to adjust tuning, envelope decay, tempo and accent amount." Features : Muxer releases Instant Sampler - a FREE sampler plugin for Mac that records the audio input whenever you hit a specific MIDI note for the first time. * velocity - Playback volume. * attack and release - Both attack & release times are configurable. 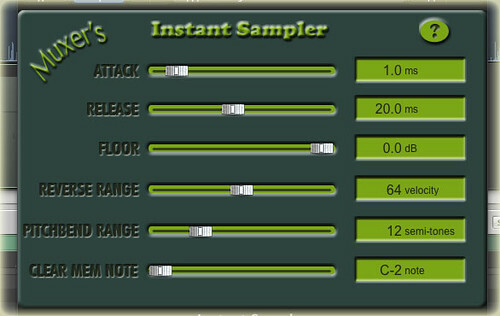 * floor - The level of the input audio which is passed along unaffected when no samples are played. * playback speed - Speed up or - down the sample playback using the pitchbend control with a configurable range. "The plugin could be named "audio copy-paster" or "snippet looper", but I choose to call it InstantSampler because it does what a simple 'normal' sampler does (playing audio fragments by MIDI notes), but it takes its samples (instantly) from the audio input whenever you hit a specific MIDI note for the first time. Every consecutive time you hit the same MIDI-note, it plays back the recorded fragment (or shorter, depending on the note's length)." # MIDI automation for all sliders and pots. # Precise fader control while holding down the "Shift" button. # ~2.5% CPU (Intel Core 2 CPU 6700, 44.1KHz, 24Bit, buffer-size 1024 Samples). "A unique -18dB low pass filter with a lot of asymmetric and random components introduce a warm and analogue sound. Very fast, non linear envelopes are also a part of this synth." Features : Eiosis updates ELS Vocoder to version 1.6 featuring a smaller interface option which allows using the Vocoder with laptop screen resolutions more comfortably. * Standard vocoder features : pitch tracker, voiced/unvoiced detector, two VCOs, two LFOs, noise generator, etc..
* Two sidechain inputs allow flexible and very easy routing : use any external synth, mixed with the internal one. 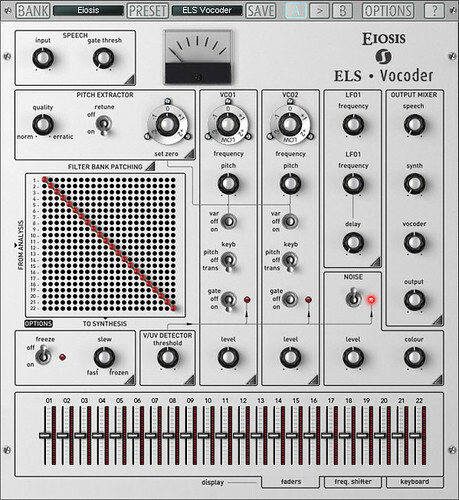 * Multiple filter bank configuration to emulate several vocoder sounds : 22, 20, 18 bands, 24/18/12 dB/oct filters, and more to come..
"The ELS Vocoder faithfully reproduces analog vocoder sounds which have been used by many artists in the electronic music history. It also includes a wide range of rare and new features, which makes it unique, powerful and simple to use. A Sidechain plugin allows to route any track to the ELS Vocoder in a simple and efficient way. You can have up to 3 stereo inputs without the need for complex routing manipulations or multichannel busses." Geared towards film, TV and game composers as well as electronica, gothic punk, industrial and ambient composers, Forbidden Planet gives users the best of both the analog and digital worlds. The collection are based on sampled analog waves, modulators and sampled filters recorded through a custom Neve 8078 console and vintage Fairchild 670 compressors. 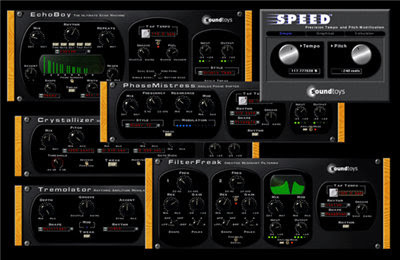 For added variety and flexibility, Forbidden Planet offers parallel programs using the unprocessed analog waves and all of the digital filters, modulators and fx. Using the new convolution technology, Q-Fusion, users can create sonic combinations such as a electric cello that is modulated by an electrical disturbance or a theremin that morphs into an ethnic vocalist. 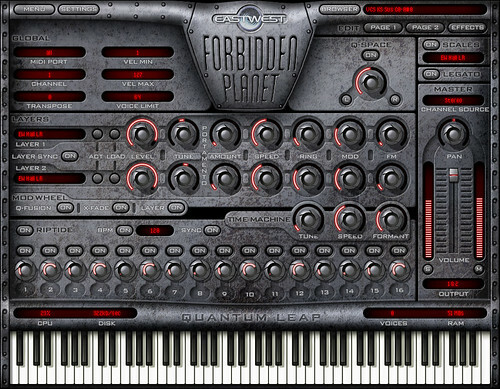 Forbidden Planet also features Riptide, a wave sequencer that incorporates real acoustic waveforms, unusual custom sound design elements, as well as sampled analog waveforms. The 3-dimensional audio image can be controlled using the collection’s Q-Space function. Musicians can expand their sound options by selecting the type of analog filter model used. The collection also has built-in multi-effects including the new “Déjà Vu” effects processor. “Déjà Vu” is a self-contained multi-fx sampling engine. To control rhythmic, glitched and melodic waveforms, Forbidden Planet also comes equipped with a serious hi-fi time and pitch machine. No infomation of price are available yet. "Forbidden Planets sounds are crafted by Nick Phoenix using the extensive range of EASTWEST/QUANTUM LEAP samples as raw material. Additional presets are provided by Troels Follman and other leading producers." Features : D16 presents Devastor - A Multiband Distortion Unit, that's an enhanced version of the distortion unit from the synth Phoscyon. "Devastor can used to distort and enhance a wide range of sounds - From full-on acid synth sounds to guitar fuzz or analogue amp with combo speaker. It can even be used with drums to make them sound more dirty and dynamic!" "PoiZone is a subtractive software synthesizer designed to bring you professional quality results, without a learning curve that hinders your creativity. 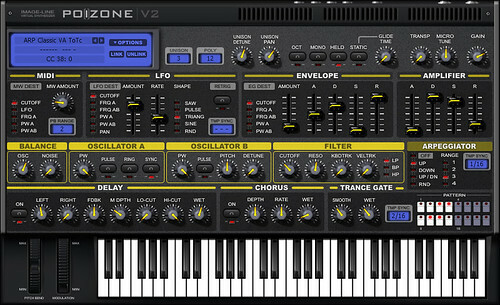 The concept behind PoiZone was to design a synthesizer that had the smallest number of controls while providing the maximum flexibility and features." Features : The Nepheton 1.0.5 update is available now. 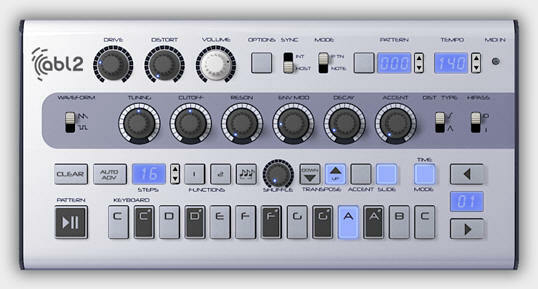 "Nepheton contains 17 fully synthesized instruments perfectly emulating the famous 808 drum machine. All the nuances and details of the instruments sounds are captured perfectly. The instruments models are equipped with additional controls giving you possibility to tweak the sound much better. Listen to the audio examples or just download the demo and try it out." "The VSM is an intuitive but highly powerful Virtual String Machine which captures many of the sounds from this genre of instrument, containing a wealth of sounds from a small mountain of classic and rare string machines. These range from the first commercial string ensembles (Eminent 310 & Freeman String Symphonizer) through to the highly lauded Solina, Elka Rhapsody, Logan String Melody, Korg PE2000 and many more. With the sheer amount of instruments captured within the VSM, it's simplicity itself to recreate all those golden string machine tones from yesteryear. However, with the VSM's comprehensive, yet intuitive feature-set, plus a two-layer option it's now possible to create your own hybrid instruments taking these sublime vintage tones into hitherto unchartered territory."